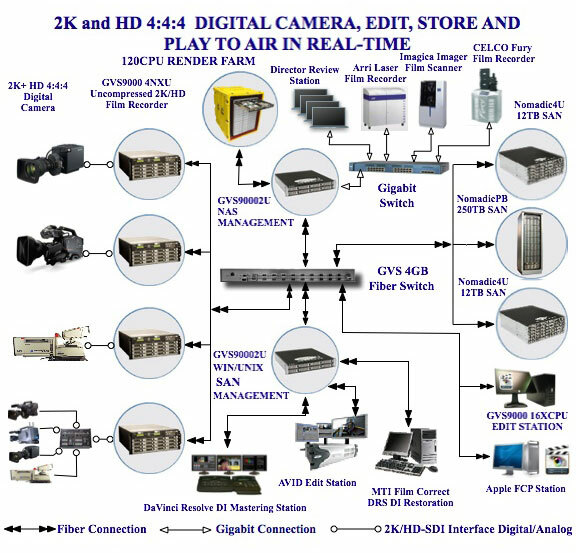 GVS90004NXU VTR offers a number of flexible options for DV to Uncompressed HD video, from single cameras, to as many as 16 concurrent capture, store and edit. (As new hardware is introduced, this number should grow) The key benefits and limitations are outlined below. The limitations are only based on the current software that available for real-time edit. 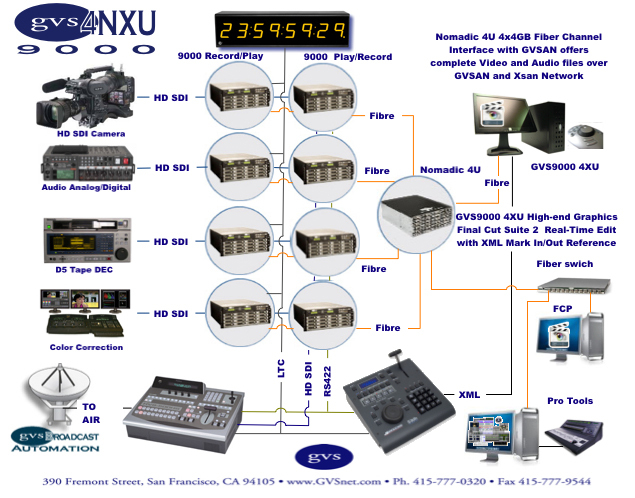 90004NXU VTR offers dual gigabit interface, which users can select from to share their media over TCP/IP with numerous different protocols, from mixed user environment to shared video and audio capture. This provides the least expense and ease of sharing for multiple concurrent users. 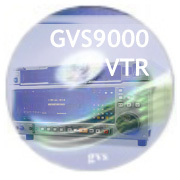 This is an ideal format - very low cost, and high speed that is built into the GVS9000 4NXU VTR. For protection, data gets mirrored on two sets of drives at the same time on Nomadic product family drives. After completion of capture or playback, users can simply remove one set of the drives from the facility and transport them to any location, and directly attach to FinalCut, AVID, Flame, Inferno, Flint, Fire or Smoke. With multiple drive sets you can also accomplish higher video quality up to SD and HD.